A photo of the Recruitment Building at the Microsoft Redmond campus. They gave me a sweatshirt, paid for lunch, and called me a cab ride home - all signs that the company was going to take care of me. I decided that I needed to something impactful during the summer between my third and fourth year of college. Fast forward a month to my interview and less than 24 hours after when I received a call from my recruiter that I would be a UX writer intern at Microsoft - and thus began the summer of a lifetime. A lot of technology has been optimized for people who learn through trial and error - because of this, other learning styles, or people who need additional support or context, have been overlooked. My intern projects strived to bridge this gap and make Microsoft products more inclusive for people across learning styles. Create a deliverable for internal design and product teams that translated research insights into actionable strategies and tips. On the Content Experience Team of the Windows and Device Group, we're responsible for the words. We work on the written and conversational elements of a user interface. Research: Develop content for a deliverable that will be used by internal design and product teams. Technical writing: Write scripts for a new feature that will exist in Settings of Windows 10. Personal reflection: Wrote LinkedIn and Medium articles about the lessons learned from my internship, and how my experience was influenced by my identity as a person of color. Here, I'll be focusing on my role with research. A lot of technology has been optimized for people who learn through trial and error - because of this, other learning styles, or people who need additional support or context, have been overlooked. My intern projects strived to bridge this gap and make Microsoft products more inclusive for people across learning styles, all while ensuring that our written content was accessible and inclusive to all Microsoft user. For this research project, I was tasked with creating a guide that would empower Microsoft designers and product teams to create products and devices that were inclusive for people with different learning styles. This is important because a user can prefer to learn in a range of ways - through a visual guide, listening to an audio tour, or by trying it themselves. How can the Content Experience Team empower customers with different learning styles? How can Microsoft teams consider guided learning as part of the design process?" 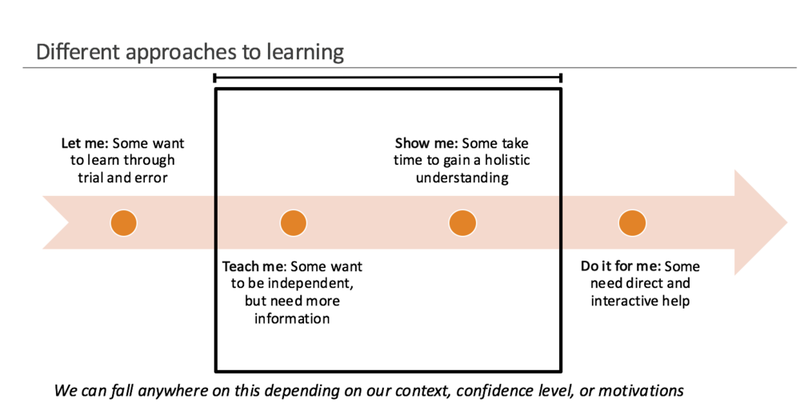 Hypothesis: Providing in-context guidance for customers, and using a set of best practices for designing to accomodate different learning styles, will empower customers and product teams. Inclusive design sprint with other members of our team! During my first week of my internship, we completed an inclusive design sprint with other writers, designers, and software developers on the team. By working with my teammates and meeting potential customers, I got a clearer picture of how we could collaborate to effectively support customers who wanted to learn through visual, auditory, or kinesthetic aides. 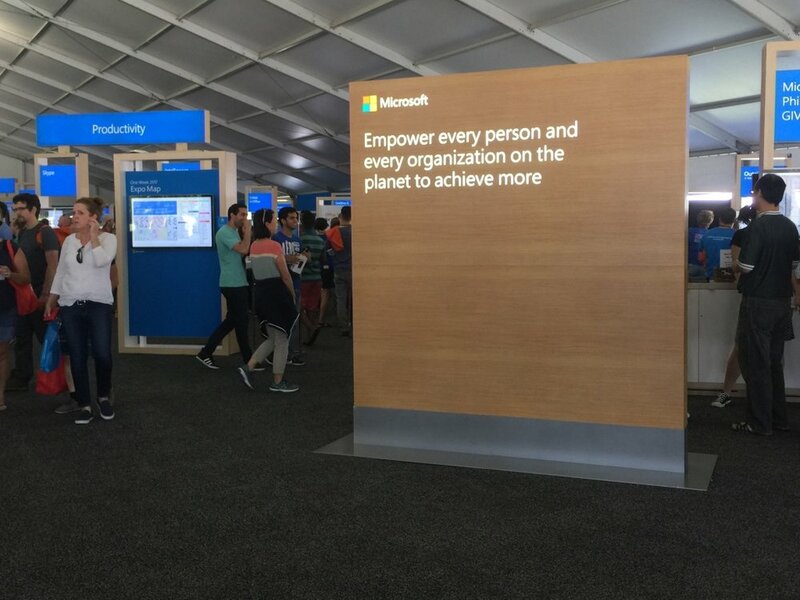 Working with customers: The most impactful part was doing interviews with actual customers, and we got to ask them about good learning experiences, past experiences with Microsoft technology. and potential pain points. We also watched them complete common tasks on their Microsoft devices and asked follow-up questions, which helped us come with principles to keep in mind when designing for these customers. Illustration from deliverable that I created! Based on my research, I created a deliverable for internal design and product teams who were creating products for this customer base. Self-serve activities that design and product teams could facilitate on their own. These were the main recommendations for creating a product or device that supported different learning styles, which were developed based on customer interviews, insights from Microsoft research, and the work of the Inclusive Design team. Key considerations when designing a product that works for multiple learning styles. One of the most significant things I learned was to make my writing more concise and conversational, so I iterated on the content until I achieved this! Being here has taught me that writing is a form a design and follows the user-centered design process in a lot of ways. The same way that you refine the scope of a research question as you look into it, or iterate on a product design in response to feedback, I had to iterate on my content to make it more concise! My summer at Microsoft taught me more than I could have ever imagined - I was a little bit nervous to jump into a big tech company after being fresh off my acceptance into Human Centered Design and Engineering, so I knew that I wasn't the most tech-savvy person in existence and I don't even have a PC anymore– but maybe my mom and my supervisor and adviser and friends were all onto something for believing in me. I've got the Microsoft badge to prove that I was worth taking a chance on.